Well here is a horn you don’t see every day. 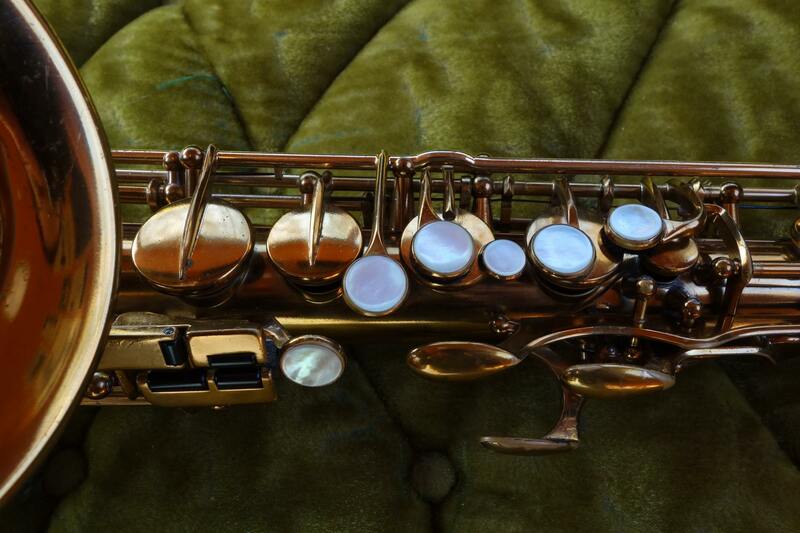 This is a Selmer “Dorsey Model” alto saxophone in what I believe to be a very old factory relacquer- though done extremely well and color-correct so most folks wouldn’t be able to tell, and even a few professionals might be fooled. 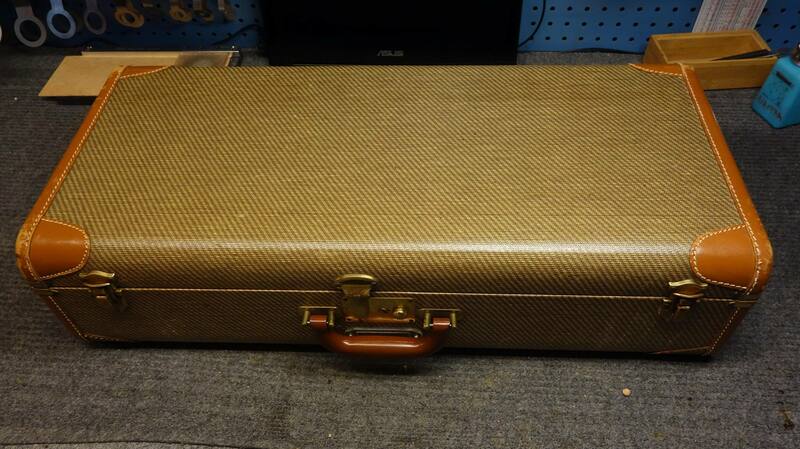 It also sports its original case, which is just beautiful. The “Dorsey Model” was a special edition, made in extremely low numbers concurrently with the Balanced Action model. The story goes that Jimmy Dorsey liked the feel of the Radio Improved keywork (left hand bell keys and old style left hand pinky table) that they made a special run of horns that are basically Balanced Action body tubes and necks with Radio Improved bells, left hand pinky tables, and bell-to-body braces. 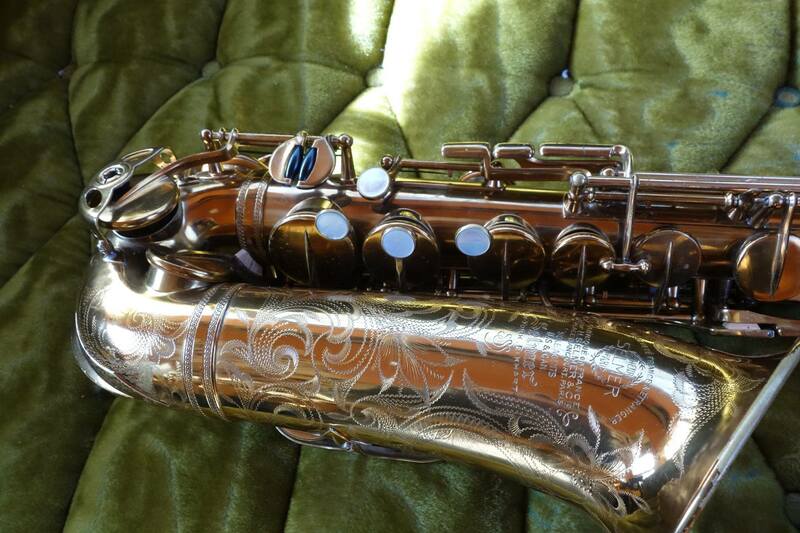 I overhauled this saxophone with a set of original Selmer Tonex resonators, and besides being rare as a hen’s tooth, it had one of the most beautiful tones of any saxophones I had ever played. 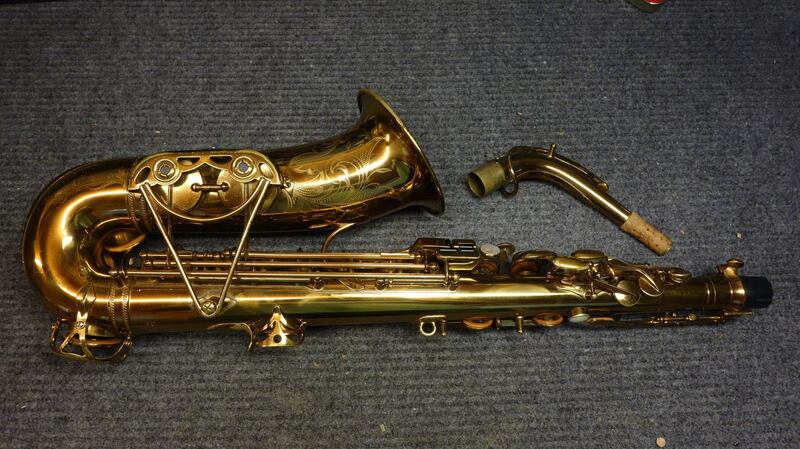 Of course it also felt great under the fingers- as you can expect from a Selmer of this vintage with their light, fast, precise keywork. But the sound, oh man the sound was something really special. It sounded like a rose smells- dense, luscious, old leather and sweetness. If it seems like I am having a hard time describing it, its because I am. 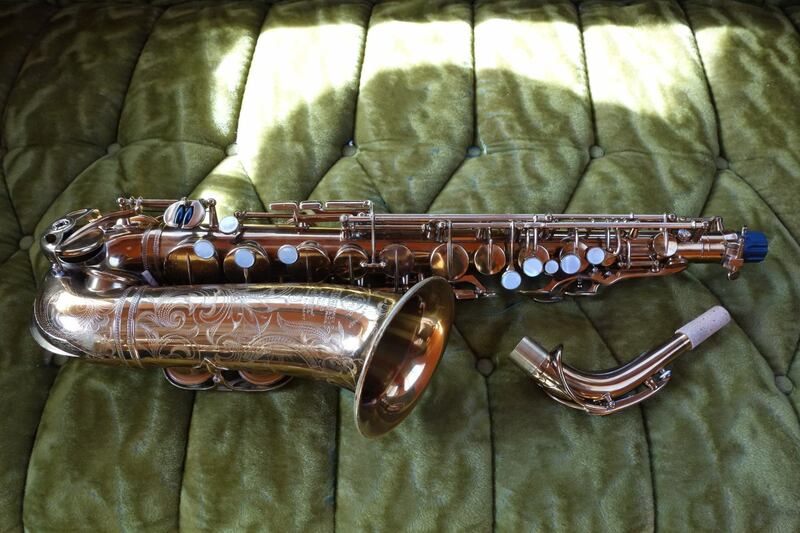 I’ve played a lot of Balanced Actions and a lot of Supers and Radio Improved saxes, and I was prepared for a horn that sounded much the same as these, but was met with something totally different. In fact, I did something I haven’t done for a while and went out and played it into the forest behind my house for nearly an hour, listening to and living in it until the owner showed up (a major faux pas!). Sometimes a horn lives up to the hype. “Beautiful horn Matt. 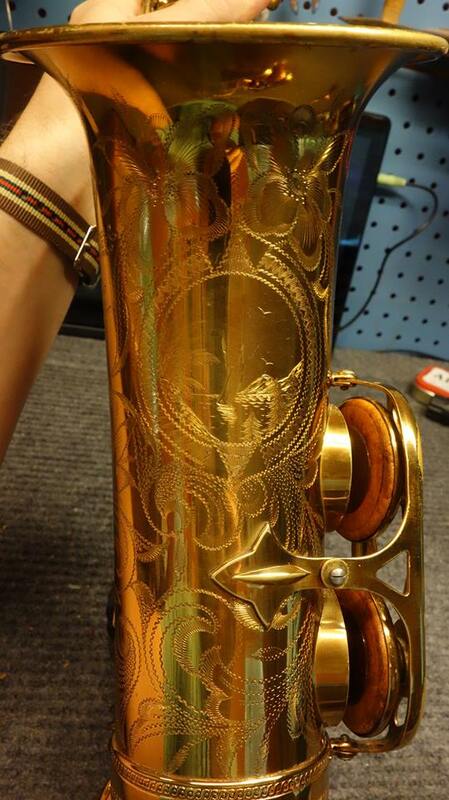 This horn is one of the 18 Dorsey Altos shipped to Selmer US on July 11, 1939. Interestingly, all the horns are listed as having been fully assembled in France. Prior to May 22, 1939, Dorseys were shipped to the US as unengraved, unlacquered horns, but from May 30, 1939 to May 1940, they were identified as being shipped as finished horns. I did actually play this one until the owner showed up to pick it up- I was only giving it the last playthrough prior to pickup and had set that time aside to take good photos- so these cell phone pictures will have to do for now. I’ll get more photos (and make a video) later. Note that the photo of the bell bell engraving is pre-overhaul. Note that these two photos below are pre-overhaul.